Well its Monday once again. I am good, and happy. 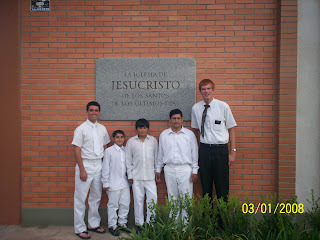 I am still in Salta capital, with my 10th comp Elder Papenfuss. We are in the 4th week of our transfer. This last saturday, the 1st, we had 2 baptisms of two young boys named Carlos and Hawkeen (sp). See picture below. This week was full of lessons, almost 20 of them. And it was a slow week. We are still working hard with Alehandro and his wife so that they can get married and then baptised. We will hopefully see them baptised soon. It is finally cooling down here in Salta, Its been a nice summer, with lots of rain and not alot of direct sunlight, which is nice when you walk outside 12+ hours a day. Tomorrow is zone conference. We also know who our new mission president will be. His name is Pres May from Orem Utah. So that will be an interesting change, going from a Latino to a gringo president. I am excited for when he comes in July. Have a great one bro! We love you and miss you!